The Security Council has voted to increase the number of UN observers in Syria to 300 for three months. A small UN team is currently in Syria to monitor a fragile ceasefire between government and rebel forces. The UN resolution was unanimously approved by the 15-member council, as the monitors were allowed to visit the city of Homs for the first time. The visit came amid a lull in fighting in the opposition stronghold, which has been under bombardment by the army. Rebels said tanks had been temporarily hidden out of sight while the observers were in the city, and that shelling was likely to resume. 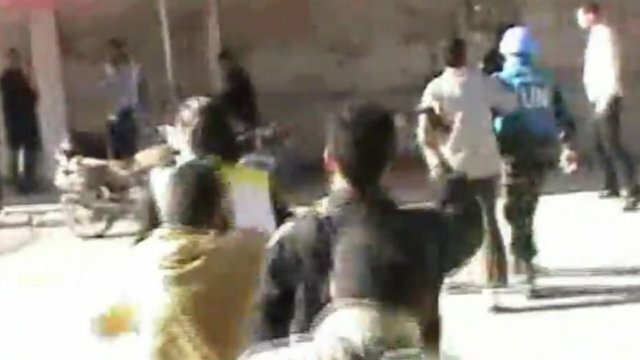 However amateur video posted on the internet shows gunfire breaking out during the visit and monitors being surrounded by Homs residents. It is not clear who is responsible for the firing. The resolution was a compromise between a Russian and a European text. The main difference was over conditions required for sending the monitors. The Russians didn’t specify any criteria. Western states wanted the deployment contingent on government compliance with the ceasefire, especially its pledge to pull troops and heavy weapons back to barracks. In the end, all agreed to let the Secretary General make the decision about when it would be safe enough to deploy the unarmed observers. But Western diplomats made no secret of their concern about the fragile state of Kofi Annan’s peace plan. The US ambassador Susan Rice warned that Washington wouldn’t wait the full three months of the monitors’ mandate to pursue measures against Damascus if it continued to violate its commitments. But it’s difficult to see what alternative the West has to the Annan plan, given that it doesn’t support foreign military intervention, and would face Russian and Chinese vetoes for any UN sanctions. A Homs activist calling himself Abo told the BBC that he and other activists had tried to protect the monitors. There is no word from the UN itself about the alleged incident. The UN resolution was adopted following a debate about the conditions for deployment. European states had said the unarmed observers should be sent only when Syria implemented its pledge to send troops and tanks back to barracks. Russia – which is regarded as an ally of Damascus – simply emphasises the need to send more monitors to Syria quickly. In the end, the resolution leaves it to UN Secretary General Ban Ki-moon to decide how and when they will be deployed. Although overall violence has fallen since the truce was signed by the UN and Syria on Thursday, many violations have been reported by activists and journalists on the ground. According to Reuters news agency, at least 23 people were killed on Friday, 10 of them in a roadside bomb targeting security forces and most of the others in army shelling on the city of Homs. The Damascus authorities say they are fighting armed terrorist groups and that the ceasefire allows them to respond to attacks. The UN estimates that government forces have killed more than 9,000 people in the uprising. Syria says foreign-backed militants have killed more than 2,600 soldiers and police. Russia’s UN Ambassador Vitaly Churkin told the council after Saturday’s vote that the resolution was “of fundamental importance” to push forward the six-point peace plan negotiated by international envoy Kofi Annan. Britain’s envoy Sir Mark Lyall Grant said the expanded observer mission “represents the last opportunity to secure a solution to the crisis in Syria. “US Secretary of State Hillary Clinton earlier in the week called for a global arms embargo and further sanctions if the government continued to break the ceasefire. The international community has also been looking at ways of getting humanitarian aid to Syria, with diplomats meeting in Geneva on Friday to discuss the situation. They agreed to a draft plan to provide $180m (£112m) for food, medicine and other supplies to about one million people inside Syria. That comes on top of the aid that is being delivered to refugees who have fled to neighbouring countries. The UN Security Council has urged Syria to implement “urgently and visibly” a peace plan requiring a 10 April deadline for ending a military offensive against the opposition. Envoy Kofi Annan’s plan calls for Damascus to pull back troops and heavy weaponry by that date, and for a full ceasefire by 48 hours later. UN Secretary General Ban Ki-moon said the conflict was getting worse. Mr Annan urged both sides to seize the moment and end the violence. “Let us stop the killing and start a serious political dialogue,” he told the UN General Assembly. 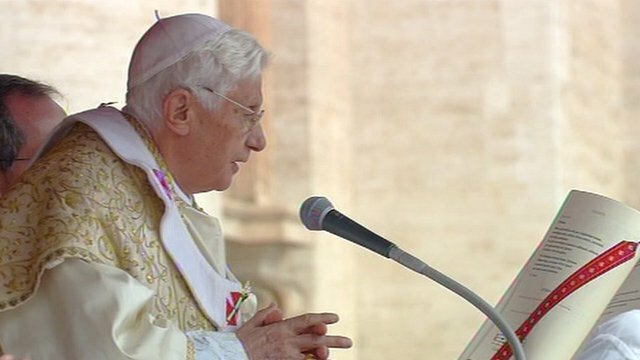 He said he expected a full ceasefire to take effect by 06:00 (03:00 GMT) on 12 April. Fresh violenceMr Annan is expected travel to Iran on 11 April, the day after the partial ceasefire is due, to try to win further regional support for his peace plan. The UN statement requested that Mr Annan provide proposals for a mechanism to supervise the ceasefire and update the Security Council on the cessation of violence and implementation of the peace plan. The Security Council said it would consider further steps depending on the outcome of these reports. Speaking later to the General Assembly by video link from Geneva, Mr Annan said he was urging the government and opposition to “issue clear instructions so that the message reaches across the country, down to the fighter and soldier at the local level”. He said that if the ceasefire was successful a small mobile UN monitoring mission of some 200-250 observers could be brought into Syria. 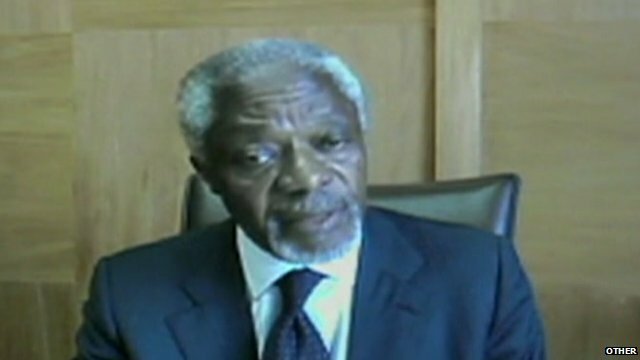 Syria had already reported some troop withdrawals from three cities, Mr Annan said, but the violence was still continuing. Activists reported on Thursday that government forces had been shelling several towns, including Homs, Deraa and the Douma suburb of Damascus. The BBC’s Jim Muir in Beirut says the activists are giving the clear impression that the Syrian regime is having a final crack at rebels before the ceasefire deadline. Earlier Mr Ban urged members of the General Assembly to deepen their support for Mr Annan’s efforts because of the deteriorating situation on the ground. “Despite the Syrian government’s acceptance of the joint special envoy’s plan of initial proposals to resolve the crisis, the violence and assaults in civilian areas have not stopped,” he said. Meanwhile the International Committee of the Red Cross (ICRC) said that Syrian officials had agreed to it having an “expanded presence” in the country. The UN says the conflict has cost more than 9,000 lives since it began a year ago. The Syrian government blames violence on “terrorist gangs” and says some 3,000 members of the security forces have been killed. Foreign media face severe restrictions on reporting in Syria, and it is hard to verify the claims of either side. Iraq’s Prime Minister Nouri al-Maliki has warned that arming either side in Syria will lead to a “proxy war”. He was speaking at the opening of an Arab League summit which is discussing a joint plan with the UN to end a year of violence in Syria. Syrian President Bashar al-Assad has agreed to the plan and will spare no effort to make it succeed, Syrian state news agency Sana reported. The summit is the first such meeting in Baghdad for at least two decades. President Assad’s remarks were contained in a message to the world’s emerging powers – Brazil, Russia, India, China and South Africa – who are meeting in Delhi on Thursday. He said he would work to enforce the peace plan but “terrorism” must stop as well, Sana reported. 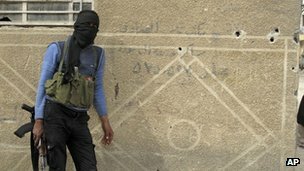 The Syrian government blames the year-old anti-government uprising on foreign-backed terrorists and armed criminal gangs. 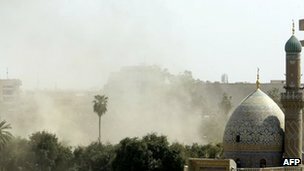 Two of the blasts occurred near the Iranian embassy, eyewitnesses said. There are unconfirmed reports that an explosion near the city’s secure Green Zone was an IED (improvised explosive device). 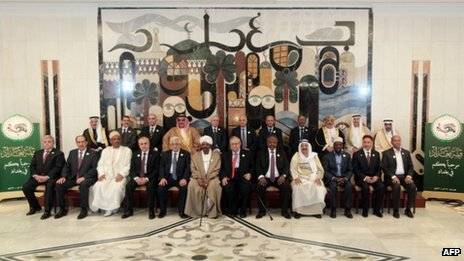 Fewer than half the Arab League’s 22 heads of state turned up for the summit, reflecting their suspicion of Iraq’s government and its close ties to non-Arab Iran. Iran is also Syria’s closest ally in the Middle East. “Based on our experience in Iraq, the option to arm either side of the conflict will lead to a regional and international proxy war in Syria,” Mr Maliki said. The Emir of Kuwait is attending rhe summit – the first visit by a Kuwaiti leader to Baghdad since Kuwait was invaded by Iraq under Saddam Hussein in August 1990. Qatar and Saudi Arabia, the two Arab states most fiercely opposed to the Syrian government, have only sent envoys. The summit is being held in such tight security at the city’s former Republican Palace that the venue was not initially disclosed to journalists. While expectations are not high for the talks, the fact that they are being held in the Iraqi capital at all can be seen as a sign of progress for Iraq, says the BBC’s Wyre Davies, in Baghdad. UN Secretary General Ban Ki-moon urged Syria “to put commitments into immediate effect”. “The world is waiting for commitments to be translated into action. The key here is implementation: there is no time to waste,” Mr Ban told the summit. Mr Ban is due to meet key leaders to discuss how the UN can work with the Arab League to put the plan, brokered by UN envoy Kofi Annan, into action. Washington has urged countries to maintain pressure on the government of President Bashar al-Assad. The US state department said it had “not seen the promises that Assad made implemented”. “It’s incumbent on all of us to keep the pressure on Assad to meet the commitment that he’s made, and that’s our intention over the next few days,” a spokesperson said. Syria has said it will not address any initiative from the Arab League, from which it was suspended last year. The opposition in Syria is sceptical about the terms of Mr Annan’s plan, with some saying Mr Assad is merely stalling for time in order to continue his crackdown. “We are not sure if it’s political manoeuvring or a sincere act,” said Louay Safi, a member of the opposition Syrian National Council. Opposition activists say at least 40 people have been killed since government troops overran the opposition-held town of Saraqeb in the north-west at the weekend. Corpses littered the streets as homes were burned to the ground and shops pillaged and looted, they said, in reports which could not be verified independently. Much of Baghdad has been brought to a standstill for the summit, which is costing an estimated $500m (£314m) to stage. The Iraqi government is hoping to re-establish itself in the Arab fold after years of violence and sectarian conflict, Wyre Davies reports from Baghdad. Little progress is expected either on the Syrian front or on wider tensions between Shia and Sunni factions in the region, he notes. But if the summit, which is expected to last for barely a few hours, passes off without incident and if there are no insurgent attacks elsewhere in the country, it will be seen as a resounding success, our correspondent adds. The Syrian government is holding a referendum on a new constitution as violence continues around the country, killing at least 20 people. The new constitution calls for a multi-party parliamentary election within three months. The opposition has boycotted the vote, calling it a farce and demanding President Bashar al-Assad stand down. US Secretary of State Hillary Clinton has said “there’s every possibility” Syria could descend into civil war. But she warned “outside intervention” could exacerbate the situation. “I think that as you try to play out every possible scenario, there are a lot of bad ones that we are trying to assess,” she told the BBC. Activists say more than 89 people died across Syria on Saturday. The Syrian government has pressed ahead with organising the referendum despite the unrest, setting up more than 13,000 polling stations for 14.6m voters. The streets are filled with billboards encouraging people to vote for the constitution but the polling stations I visited were nearly empty. At one school, two people showed up to vote in the 20 minutes I was there, although Ahmad Baalbaki, who was supervising the process, said 300 people had cast their vote. Muneira, a housewife, says she voted “yes”. She hasn’t read the constitution but she supports the president. In a central square, a pro-Assad rally is taking place in support of the constitution. Nearby, a group of young men and women were handing out booklets to encourage people to vote. One of them, Husein Saqer, said:”People don’t want to vote because they see no difference between this one and the other constitution, but we are here to tell them to vote”. Voting began at 07:00 (05:00 GMT) and polling stations are due to stay open for 12 hours. 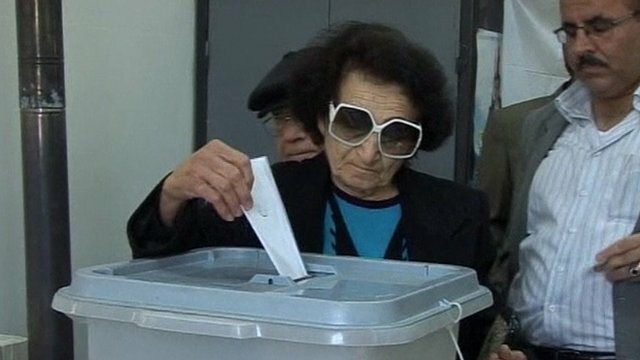 State television showed people voting in Damascus and various other places, and it all looked fairly normal, the BBC’s Jim Muir reports from neighbouring Lebanon. But, he added, in many other parts of the country, it is far from normal, with explosions and shooting reported from the east, west, north and south – in areas where violence has been going on for months. At least nine civilians and four soldiers were killed in the embattled city of Homs, the UK-based activist group, Syrian Observatory for Human Rights, said. Violent clashes were reported in the central city of Hama, the north-western province of Idlib and in Daraa province, south of Damascus. The vote is on a new constitution that would allow for more opposition to Mr Assad’s Baath Party, but it has been rejected out of hand by critics of the government. One group described the new constitution as fraudulent and the referendum as a farce. It pointed out that the regime had never respected the old constitution, which enshrines freedom of speech and peaceful demonstrations and bans torture. Turkey’s Foreign Minister Ahmet Davutoglu expressed doubt about the timing of the vote: “On one hand you say you are holding a referendum and on the other you are attacking with tank fire on civilian areas. “You still think the people will go to a referendum the next day in the same city?” he said at a news conference in Istanbul. The US has dismissed the referendum as “laughable”. The Observatory said Saturday’s deaths included 24 civilians in the embattled city of Homs and that 23 government soldiers were killed in clashes with rebel groups across the country. The Red Cross has been trying to evacuate more people trapped in Homs’s Baba Amr suburb but admitted it had made no progress on Saturday. Among those it is trying to help are two injured Western journalists, Edith Bouvier and Paul Conroy. It also wants to retrieve the bodies of another two journalists, Marie Colvin and Remi Ochlik, who were killed last week. 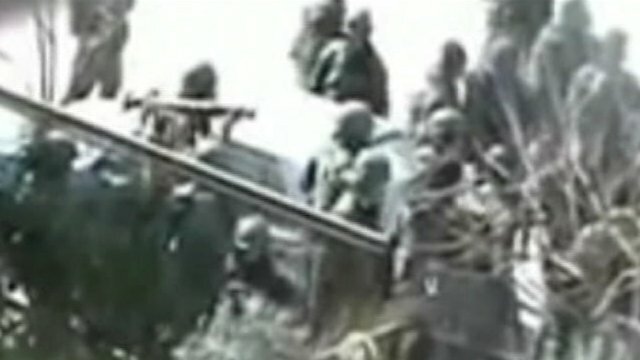 Hundreds of armed rebels from the Free Syrian Army are holding out in Baba Amr. Meanwhile, international pressure is mounting on Mr Assad to end his government’s 11-month crackdown on opponents. Kofi Annan, the former UN secretary general who has been appointed the UN and Arab League’s envoy to Syria, called for all parties to co-operate in finding a peaceful solution to the crisis. On Friday, a meeting of the “Friends of Syria” group was held in the Tunisian capital, Tunis. Delegates from 70 countries issued a declaration calling on the Damascus government to end violence immediately, allow humanitarian access, and permit the delivery of relief supplies. The UN estimated in January that 5,400 people had been killed in the conflict. Activists say the death toll now is more than 7,300. The Syrian regime restricts access to foreign journalists and casualty figures cannot be verified. Shelling resumed shortly after daybreak on Monday, says BBC’s Paul Wood who has managed to get into the city. It was a quiet night until just after dawn, when we started hearing mortars falling – about one every 30 seconds. Some heavy artillery has also been used. Some people have now got out onto their balconies to shout, “God is great!” We also had quite a lot of small-arms fire from rebels fighters. That is a pretty futile gesture. It is Kalashnikovs against big guns. Most people have been getting inside, hiding in the stairwells to put as much concrete between them and the street as possible. We’re hearing a report this morning from an eyewitness saying the government troops have been moving up to the outskirts of this part of Homs – not armoured vehicles or tanks, but infantry troops. They haven’t yet gone through the first rebel checkpoint. It is not yet an invasion, but that is what people fear over the next day or so. 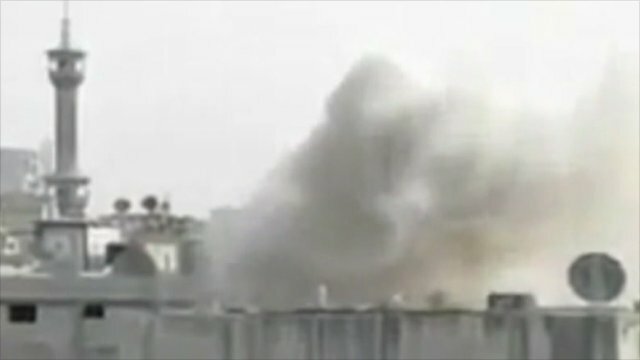 Syrian state TV said “terrorist gangs” had blown up buildings in Homs. The state-run Sana news agency reported that an oil pipeline near the city had been hit by an explosion on Monday. It also blamed “terrorists”. 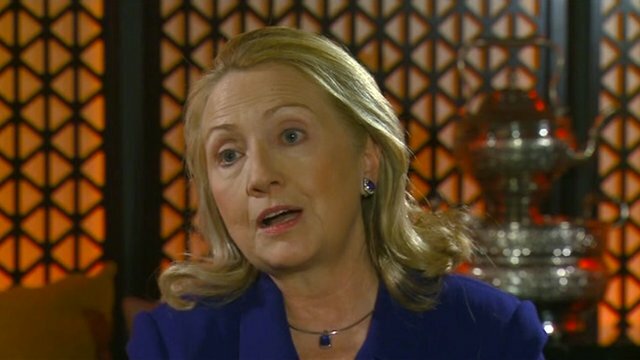 US Secretary of State Hillary Clinton on Sunday called the veto a “travesty”. “I think it is very important for us to try to resolve this without recourse to outside military intervention. And I think that’s possible,” he said in an interview for the NBC network’s Today programme broadcast on Monday. He added that a negotiated solution was possible and said the US was “relentless” in demanding that Mr Assad leave power. Speaking in Bahrain on Monday, he said encouraging “armed extremist groups” would only cause more casualties, and said Moscow supported peaceful dialogue in Syria. The Chinese government also defended its veto. It said the draft resolution would only have complicated matters, and said Beijing sought to “avoid the scourge of armed conflict”. President Assad’s government says at least 2,000 members of the security forces have been killed fighting “armed gangs and terrorists”. 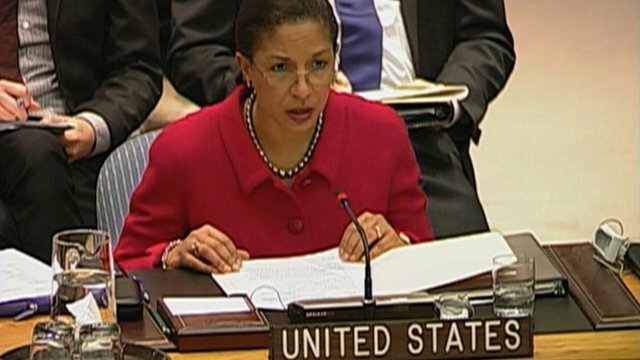 Speaking shortly after the vote in New York, the US ambassador to the UN, Susan Rice, said that Washington was “disgusted” and that the Security Council was being “held hostage by a couple of members”. Speaking shortly after the vote in New York, the US ambassador to the UN, Susan Rice, said that Washington was “disgusted” by the move. (CNN) — As international leaders express outrage over mass killings in Syria — and lament the inability to pass a U.N. Security Council resolution denouncing the Syrian regime — questions linger about the two countries behind the impasse. On Saturday, China and Russia vetoed a draft resolution that would have demanded Syrian President Bashar al-Assad stop the killing and answer calls aimed at finding a Syrian-led solution to the 11-month crisis. 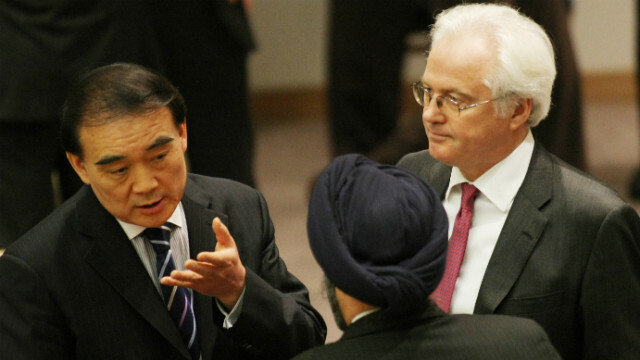 Analysts say both China and Russia have their reasons to maintain good relations with Syria. Russia is one of Syria’s biggest arms supplier. And China ranked as Syria’s third-largest importer in 2010, according to data from the European Commission. “Beijing’s renewed interest in Damascus—the traditional terminus node of the ancient Silk Road … indicates that China sees Syria as an important trading hub,” according to a 2010 report from The Jamestown Foundation, a Washington-based research and analysis institute. Last week, China’s permanent representative to the United Nations said the killing of innocent civilians must stop, but also said he is against “pushing through” a regime change. An earlier version of the U.N. Security Council draft resolution called for al-Assad to step down and delegate his powers to his deputy, but that element was not in the draft voted on by members Saturday. “China is of the view that the Syrian people’s request for reform and safeguard of their interests should be respected,” Li Baodong said Tuesday, according to China’s state-run Xinhua news agency. “It is imperative to put an immediate end to all violence in Syria and oppose and stop the killing of innocent civilians. “At the same time, an inclusive political process with a wide participation of all Syrian parties must be started without delay to speed up reform and resolve differences and disputes peacefully through dialogue and consultations,” he said. Russia also has an economic interest in Syria. The total value of Syrian contracts with the Russian defense industry likely exceeds $4 billion, according to Jeffrey Mankoff, an adjunct fellow with the Center for Strategic and International Studies Russia and Eurasia Program. He noted the Stockholm International Peace Research Institute estimated the value of Russian arms sales to Syria at $162 million per year in both 2009 and 2010. Moscow also signed a $550 million deal with Syria for combat training jets. Russia also leases a naval facility at the Syrian port of Tartus, giving the Russian navy its only direct access to the Mediterranean, Mankoff said. As Western leaders sought to pry al-Assad from power, Moscow sent an aircraft-carrying missile cruiser to Syrian waters in a show of support last month and shipped Syrian troops a consignment of Yakhont cruise missiles, according to Daniel Treisman, a professor of political science at the University of California, Los Angeles. Speaking after the Saturday vote, ambassadors from both Russia and China said they do support an end to the violence but felt the resolution did not address the crisis properly. Russian Ambassador Vitaly Churkin said the text “did not adequately reflect the real state of affairs and sent an unbalanced signal” to the various sides in Syria. He noted that the minister for foreign affairs will visit Damascus to hold a meeting with al-Assad this week. 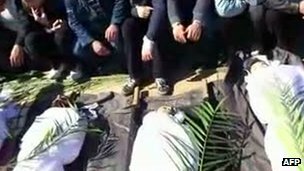 China and Russia vetoed another Security Council resolution in October that would have called for an immediate halt to the crackdown, which United Nations officials have said resulted in an estimated 6,000 deaths since protests began nearly a year ago. 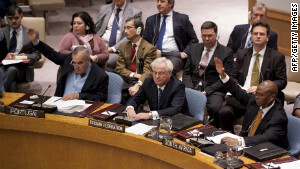 With the Security Council failing to approve a resolution, what happens next is unclear. But as the diplomatic stalemate continues, the death toll in Syria climbs even higher. The Local Coordination Committees of Syria, a network of opposition activists that organizes and documents protests, said the violence has killed more than 7,300. 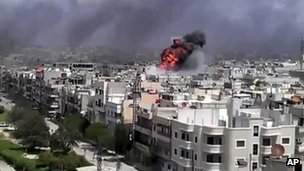 Syrian government forces have bombarded the city of Homs with tank shells and mortars, killing more than 200 people, opposition groups say. Activists say a massacre has occurred but the government denied attacking, accusing the opposition of propaganda. A BBC correspondent outside Homs says opposition fighters, though outgunned, plan to launch a “general offensive”. 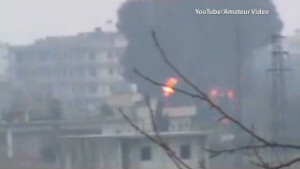 US President Barack Obama sharply condemned the Homs attack, as diplomats met at the UN to discuss a resolution. He accused President Bashar al-Assad of launching an “unspeakable assault” on his own citizens, and called for him to resign and for democratic elections to be held. A vote is expected later on the UN draft resolution, despite Syrian ally Russia voicing strong objections. Foreign Minister Sergei Lavrov said on Saturday the current draft included measures against President Assad’s government, but not against armed opposition groups. 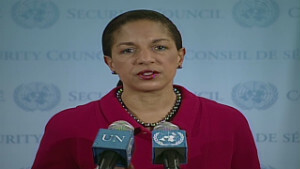 But Russian amendments to the text were described as “unacceptable” by the US ambassador to the UN, Susan Rice. Mr Lavrov is due to have talks with Mr Assad in Damascus on Tuesday, along with the head of the Russian Foreign Intelligence Service, Mikhail Fradkov. In another development, Tunisia moved to sever relations with the Assad government. We are travelling with a group of rebel fighters – the Free Syrian Army, as they call themselves. They first got news that a huge bombardment was taking place in the early hours. They immediately started a “blood drive”, attempting to take donated blood into the city to help out. But so far they’ve been unable to get that blood into Homs because the city has been cut off by checkpoints and tanks. It’s always difficult to get in to Homs, but after this, it is more difficult than ever. We’re travelling on back roads to avoid the presence of checkpoints and tanks. The information we’re getting from inside the city is that mortar shells and tanks were used in what we’re hearing was a pretty relentless bombardment in those areas that are outside of the regime’s control. The rebels now say that they’re going to launch a general offensive some time in the next 24 hours in response to the attack. 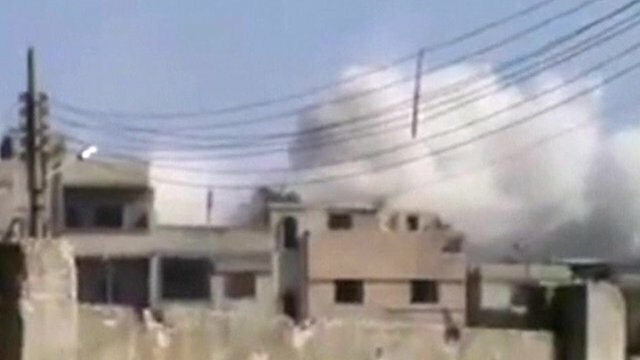 Homs appears to have come under a “pretty relentless” bombardment, which targeted areas outside government control, the BBC’s Paul Woods reports from just outside the city, where he is travelling with fighters from the Free Syria Army. He says the fighters are trying to get in via back roads with blood supplies for the casualties. Funerals have already begun in large numbers, our correspondent was told, amid reports of a death toll as high as 260. “Yesterday the Syrian government murdered hundreds of Syrian citizens, including women and children, in Homs through shelling and other indiscriminate violence…” President Obama said in a statement in Washington. Russia’s foreign minister said it would be a “scandal” to ask the UN Security Council to vote on the resolution in its current form. Russia is Syria’s main ally on the council, and has said it will veto any resolution calling on Mr Assad to stand down. Moscow has continued to supply weapons to Syria despite the protests. However, French Foreign Minister Alain Juppe said the Homs assault was a “further step in savagery” and warned against a veto. “Those who would hinder the adoption of such a resolution would assume a heavy responsibility in history,” he said. 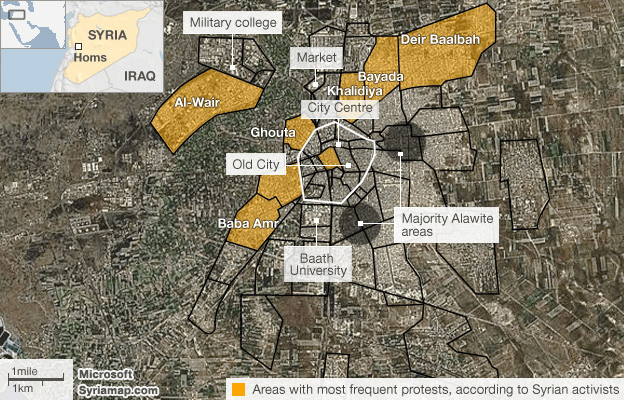 A death toll higher than 200 at Homs would make it by quite a long way the bloodiest day since protests began. Homs was one of the first cities to join anti-Assad protests, and became one of the focal points of dissent after government forces fired on crowds in April last year. Many army defectors have sought refuge in the city. Activists said most of the deaths were in the residential area of Khalidiya. Reports said a hospital had been destroyed in Khalidiya, and residents said more than 30 houses had been wrecked in the barrage. “We were sitting inside our house when we started hearing the shelling. We felt shells were falling on our heads,” Khalidiya resident Waleed told Reuters news agency. Video footage emerged on the internet showing several bodies covered in blood with a voiceover saying the bombardment was still going on. State media dismissed the Homs casualty reports as a “hysterical campaign of incitement” by armed gangs designed to influence the UN. “The civilians shown by satellite television stations are citizens who were kidnapped and killed by armed gunmen,” said a report on Sana news agency. International media outlets are restricted in Syria, making it difficult to verify the claims of either side. 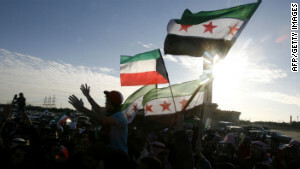 Syria has been gripped by nationwide protests against Mr Assad’s regime for almost a year. The UN stopped estimating the death toll after it passed 5,400 in January, saying it was too difficult to confirm numbers. The Syrian government says at least 2,000 members of its security forces have been killed fighting “armed gangs and terrorists”.